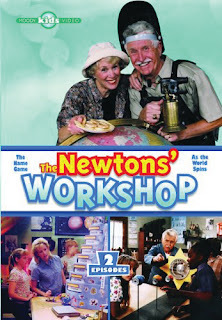 That stars of this children's "edutainment" show are most certainly Grandma and Grandpa Newton, who have more spare time and are quirkier than any grandparents you know. Over the course of this 8-episode series, this set of seniors is ready to help any time their grandkids have a question or a problem. And in Episode 4, when an astronaut's visit has Trisha curious about space, Grandpa helps puts the solar system in perspective. He creates a scale model in which the Sun is the size of a beachball, and Earth is almost a soccer field away. It's fast-paced, funny, and has my daughters' attention even after repeated viewings. What I like is that they teach science from a conservative Christian perspective, which isn't surprising considering these are produced by the generally Calvinist, Moody Bible Institute. And, while I'm not up for quite as many viewings as my kids, these are entertaining enough that I don't mind seeing the repeats now and again. That said, I did have a caution to share. In Episode 8, "The Pollution Solution," Grandma and Grandpa tackle the problem of pollution, and while most of this episode is sensible and helpful, there is a dash of confusion and a spoonful of tokenism mixed in. It begins with Dad calling a family meeting about the way everyone is wasting water. But he misrepresents the problem: he make it seem like long showers can contribute to drought, but shower water heads down pipes that will eventually return it right back to the lake or river it came from. Waste is happening here, but it isn't contributing to any drought. What's going down the drain, never to be seen again, is mom and dad's money, paying for water that isn't needed. The tokenism comes in when Tim and Trisha end up having a trash contest to see who can generate the least amount of trash over a week. What isn't addressed is that recycling costs money - it takes resources too - so some recycling isn't always the responsible choice. We see a similar sort of tokenism when the Newtons briefly address global warming. This episode was made 20 years ago so, compared to anything today, the doom and gloom is a lot less pronounced. But we do get fed today's typical non-solutions: Tim and Trisha suggest global warming can be addressed by "walking on short errands, or riding your bike, or carpooling to work." Sounds good, and you'll hear suggestions like that made today too. But it misrepresents the radical nature of the changes global warming proponents are really after. It isn't a matter of more bikes, but fewer children. Now, if the show's producers had heard that sort of argument 20 years ago I think they might have seen through it. They'd know from the Bible that children are a blessing to be embraced, so when the world says the opposite – that they are a curse to be avoided – that gives Christians reason to be skeptical. That said, Grandpa Newton has some good things to say in this episode too, and I think it can be watched to some benefit so long as mom and dad are there to talk their kids through it. But if you aren't buying this as a package set, then DVD #4 might be worth giving a miss. So who would like this best? While the producers recommend this for 7-12, I'd lower that on both sides by about 2 years. This is best suited for 5-10, although Mom or Dad can enjoy it too. 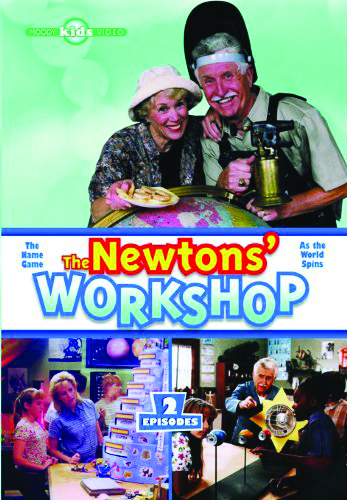 Overall this is just a fun, clean, biblically-based, science lesson wrapped up as family TV series. It entertained our family and educated them too - not a bad combination!